We’d love your help. Let us know what’s wrong with this preview of Mistaken Identity Crisis by James J. Cudney. A clever thief with a sinister calling card has invaded Braxton campus. A string of jewelry thefts continues to puzzle the sheriff given they’re remarkably similar to an unsolved eight-year-old case from shortly before Gabriel vanished one stormy night. When a missing ruby is discovered near an electrified dead body during the campus cable car redesign project, Kellan must A clever thief with a sinister calling card has invaded Braxton campus. A string of jewelry thefts continues to puzzle the sheriff given they’re remarkably similar to an unsolved eight-year-old case from shortly before Gabriel vanished one stormy night. When a missing ruby is discovered near an electrified dead body during the campus cable car redesign project, Kellan must investigate the real killer in order to protect his brother. Amidst sorority hazing practices and the victim’s connections to several prominent Wharton County citizens, a malicious motive becomes more obvious and trickier to prove. 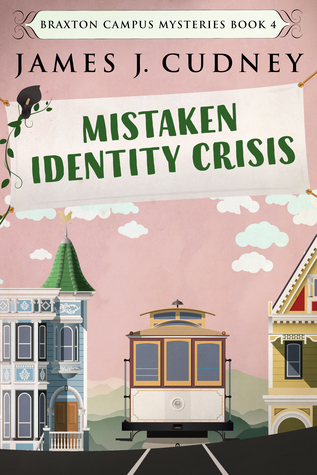 To ask other readers questions about Mistaken Identity Crisis, please sign up. I'm an avid genealogist (discovered 3K family members going back about 250 years) and cook (I find it so hard to follow a recipe). I love to read; between Goodreads and my blog at https://thisismytruthnow.com, I have over 800 book reviews which will give you a full flavor for my voice and style. On my blog, I started the 365 Daily Challenge, where I post a word each day that has some meaning to me, then converse with everyone about life. There is humor, tears, love, friendship, advice and bloopers. Lots of bloopers where I poke fun at myself all the time.